Health – Ann Dunnewold, Ph.D.
Those are the lyrics to “Surfin’ Safari” by Beach Boys Brian Wilson and Mike Love, which are my latest earworm. Maybe they can bring a little feeling of summer to this crazy-temperatured winter, swinging here in Dallas from 32 degress this morning to 76 degrees earlier in the week. Thinking about actual surfing is not my intent, however, or the impetus that embedded that song on repeat in my head. The concept of “riding the waves”, rather, has been on my mind because of the concept of mindfulness and it’s usefulness in coping with the stresses of daily life. 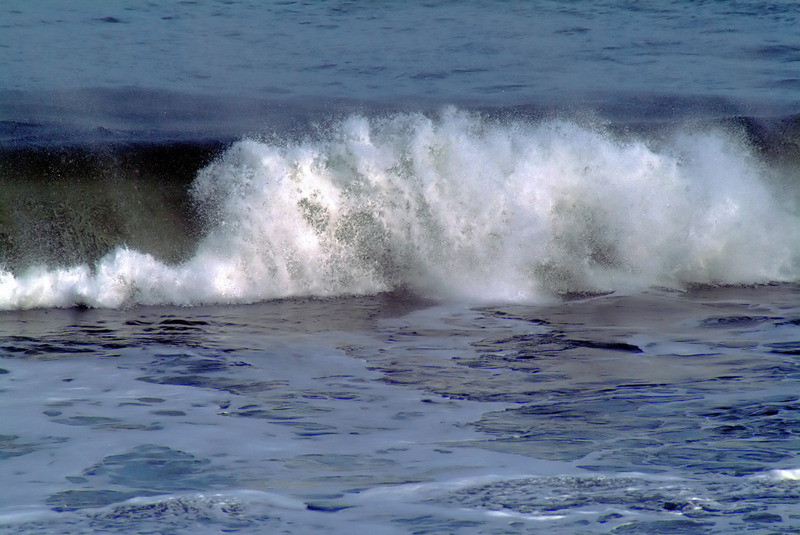 As we attempt to manage what life throws us, riding the waves is an apt analogy. In the midst of bad stuff, of whatever type–anxiety, grief, depression, cravings–it’s pretty human to feel that the conflict or stress will pull us under, swamp us, knock us down, literally drown us. Most of us tend to lose sight of the big picture, focusing instead on the looming tsunami of our lives. Especially if we’re prone to negative thinking, brains run on repeat: “I’ll never get over it,” “It will always be this way,” “I can’t stand it any longer.” Of course we feel overwhelmed. Bring in the concept of surfing the waves, however, and challenges become manageable. Troubles, of whatever type, do have a natural ebb and flow. After every wave comes a trough. The power that threatens to sweep us away is replaced by the calm. In the midst of negative feelings, it’s extremely helpful to step back and notice. Watch your anxiety, even timing it with a stopwatch. You zero in on the worry, and it dissipates a bit. Examine your cravings: you must have that Krispy Kreme one moment, and the next minute your mind has moved onto something else. Charting your hunger over the course of two hours shows definite dips and peaks. 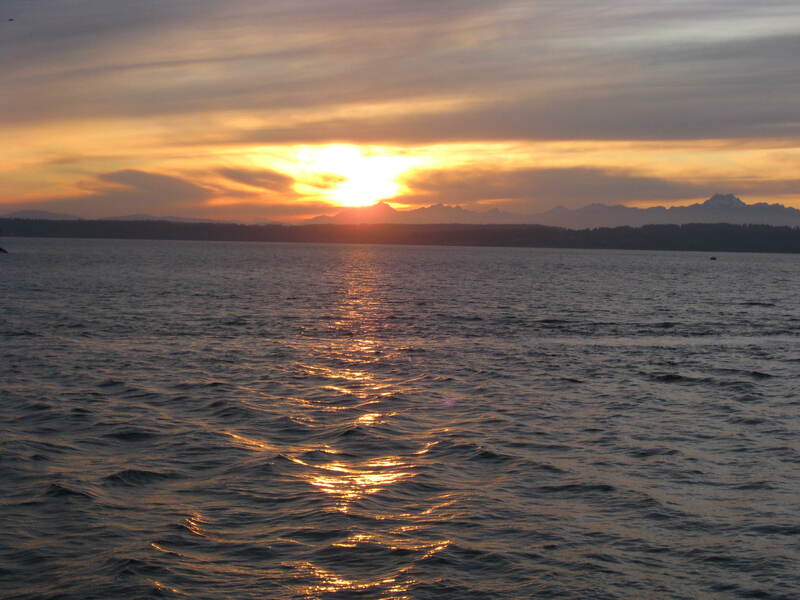 Allow yourself to vent your anger, or sob through your grief for twenty minutes, and just like the waves, calm rushes in. You’re cried out–for now. Illness wrecks your week, and the next week, everyone is well. It’s a powerful exercise to step back, notice what you notice (in the words of Stephanie Eldringhoff, a new teacher I’ve enjoyed discovering), and see that just the act of noticing can begin the shift. Be reassured that after every pounding wave, there is that drift to calm. Sure, sometimes the waves come faster and more furiously than we feel we can stand. That’s the point to give up on holding the stance, and ride the waves instead. We can manage so much more when we are mindful of that fact that there’s bound to be a break soon. Trust that relief will come, the intensity will lessen, and you’ll hang on and ride that surf. Call it a mindfulness safari, and venture into it with open arms. News about flu season is always a little scary, bombarding us with the latest figures on how bad the flu is, shortages of vaccine, endless “woe is me” commentary. I don’t like to read these scary headlines, but the reality is that this time of year we are bombarded with tips about how to stay healthy. Wash your hands, take your vitamins, eat chicken soup, get your flu shot, see your doctor within the first 48 hours of symptoms to try and rein in the toll. One of the most fascinating–and accessible–answers this year has been a study by researchers at the University of Wisconsin. Bruce Barrett, MD, PhD and his colleagues had three groups of participants. One group exercised, one group was simply observed in their regular lives, and one group took a mindfulness-based meditation course. Participants were then monitored by telephone, and tested for illness if they reported “I feel like I might be getting sick.” When participants in the mindfulness course did get sick, the duration of illness was shorter and they recovered more quickly, missing 76% less work than those in the other groups. Anyone can practice mindfulness. Take time to sit, breathe, rest, practicing being in the moment. Tune into one bodily sensation for just one or two minutes. Teach the red light meditation to your kids: every time you’re stopped at a red light, pick one of the five senses to zero in upon for the duration of the light. Search Youtube and you’ll find lots of ways to introduce yourself to mindfulness. Or stay tuned for the commercial message: Level I and II mindfulness meditation groups are beginning in my office in the first week of February. We practice mindfulness from the very first session, learning to integrate it into your daily life in a way that works for you. Fears. We all have ’em. Fear of public speaking is the most common. Fear of missing out is the newest I’ve heard, with a handy acronym: FOMO. Fear of failure. Fear of success. Fear of spiders. Fear of being alone. Fear of flying. Fear of messing up as a mother. You name it. Facing our fears is the basic human condition, as pointed out in one of my favorite films, Defending Your Life. When the clock radio turned on this morning, the DJ announced that now, to address this most basic human state of anxiety, we have a day dedicated to facing those fears. Face Your Fears Day. Today’s the day, the second annual to be exact. In that spirit, I’d like to toss out my favorite mantras for doing just that. And the corollary: Don’t believe every thought you think. It’s just anxiety, not reality. Self-compassion is a good place to start, loving yourself, fears and all. Giving yourself that validation, rather than chastising yourself for being fearful, aka for being human, means you can drop the ‘second dart’ of self-criticism. The first dart is the visceral fear; the second dart, unnecessary, is that judgment you impose upon yourself. I don’t know that many people who don’t have a few, steering their lives, even if the fear is lurking deep below the surface. And the fact that we’ve dedicated a day to the concept is further proof that fear is a pretty universal condition. And my second favorite way to cope: exhale. Everyone touts deep breathing as a way to calm yourself. Even these supposedly simple directions can add stress: fear of breathing wrong! Or not finding time! The bottom line, in terms of the nervous system, is that taking a great big deep breath IN actually activates the alarm system of the body, telling your body to prepare to fight or flee. Let out a big deep EXHALE instead, and you send a message to your nervous system that there is no danger, and it’s safe to relax. That’s it. One move. Repeat as needed. Simple. Practice it just like blowing out birthday candles; we all conquered that skill when we were three. What are your fears? What’s your favorite way to conquer them? First of all, please forgive the quiet around here. Or, to shift perspective as I’m always wont to do, consider it my small October gift to you. My lack of post meant one less thing to do on your list. Excuses, excuses: illness, taking on a new task of teaching at the community college, a never-ending home-redo project, and a real bit of vacation have kept me from posting. At casual glance, you may ask: so what, iced tea. The perspective got a bit skewed transferring the picture from my phone to the computer, so the glasses look like the quintessential Texas quart size. 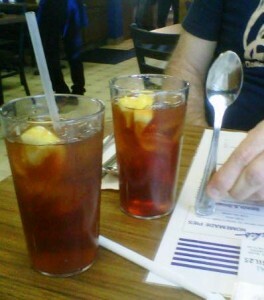 So note the normal size tea spoon for comparison. The second behavior change required while walking around Seattle was the stop lights. The guidebook stated that pedestrians could get ticketed for crossing against the light. Must wait for the little white walking-person light that means go! And all the Seattle-ites stop and wait. And breathe, I assume. Most cities I’ve visited, Dallas and NYC in particular, are filled with pedestrians eager to play chicken and dash whenever they can. No time to waste! Ten seconds at stake here! Then there were the ferries. Line up in your car–and sit and wait some more. 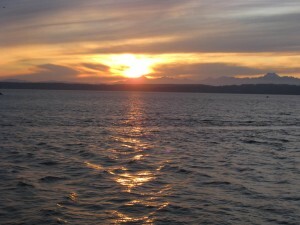 We missed the ferry to Whidbey Island and had to wile away the wait, sauntering around to view the scenery. Just a way of life: to wait, rather than hurtle through space at breakneck speed. And scenery? Mind-boggling after so much time on the Blackland prairie of North Texas. Mt. Rainier here, Mt. Baker there, Olympic mountains over there. Greenery, lakes, sunsets over the water: a view in every direction. And the sun was shining every day. I’m now even more intent on sloooowwwwwing down. Pardon me while I stop and breathe. Is your iPhone a permanent part of your anatomy? Glued to your hand, or your hip? Can’t walk by a computer without checking the latest Facebook feed? Have to see if your “Words with Friends” pals have responded? Need your dose of “Angry Birds”? We’ve become slaves to our technology–phones, email, iPads. A psychology journal even exists to study the multitude of effects this ever-present technology has on our behavior and well-being. Benefits abound; last night my critique group could Skype with one member who is on sabbatical in England for a year. Very fun stuff. But if you’re tired of the energy drain of this instant connecting–always having to keep up with the email or keep the cell phone immediately accessible–consider joining Day to Disconnect this weekend. We worry that we might miss something. The kids or sitter might need us. Catastrophe might befall someone. We might fail to nab a great Groupon deal or a must-have-it freebie on Freecycle. Oh well. Sounds like the kind of all-or-nothing, black and white thinking that I love to diffuse. You can take an hour–or a day–off from your technology, just to test out the theory that the sky might fall. Turn it off. Leave it alone. Connect with a loved one, or nature, or an old-fashioned book. See if the frantic, always-on pace that makes our nervous systems hover about ten degrees below panic mode relents, just a tiny bit. I dare me. I dare you. We deserve it.